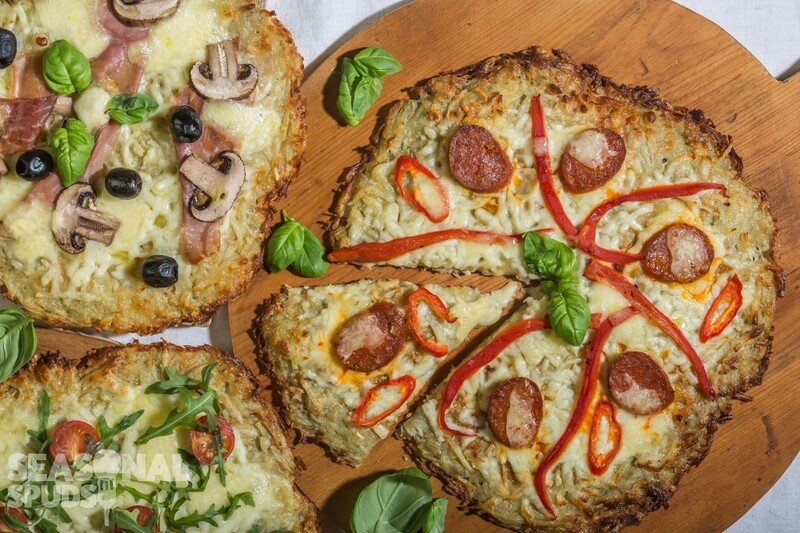 This really simple and easy to make potato pizza is a great gluten-free alternative to traditional pizza dough. Get creative and choose your favourite toppings, which is fun for all the family. 2Peel and grate the potatoes. Place them in a tea towel and wring out to remove the liquid. 3In a large bowl mix the potato with the egg, oil and seasoning. 4Line a baking tray with parchment paper and flatten the potato mixture to a pizza shape. 5Place in the pre-heated oven for 25 minutes until almost cooked through. 6Remove from the oven and add toppings of choice and put back in the oven for a further 10 minutes or until toppings are cooked. This is a great way to use up Christmas left-overs and makes a great centrepiece for lunch with family and friends.